Your average DIY home improvement projects can actually require using materials that are considered "hazardous." In fact, many of the common building materials you work with in a remodeling project can have potentially dangerous components in them. While this may be apparent to you with the liquids, adhesives, paints and other chemical-based products involved, other materials can pose a threat. Depending on their composition, your cut-offs, scrap pieces and other debris from these materials can become "hazardous waste" when they hauled off and disposed of. Is Your DIY Project Waste Material Hazardous? No one wants to feel like they have to bring out a HazMat team to deal with their DIY debris! While many people will avoid buying or using products or materials they think might be toxic or even hazardous, that's not easy to do. Quite likely, as a conscientious homeowner, you do your best to minimize the presence of any hazardous materials or products in your home already. Unfortunately, they can't be completely avoided. The fact is that construction waste is not the same, but it's not all hazardous. When it comes to your DIY renovation or building project waste removal chore, however, the presence of potentially hazardous materials needs to be expected. While some substances and materials are easily recognized as being hazardous, you might be surprised at what else is actually considered hazardous, as well. Unfortunately, much of the debris from construction and demolition projects, for example, will contain dangerous wastes. And local, state, and federal rules require this to be properly managed and disposed of. Consequently, this can apply to your own remodeling or renovation project. In addition to the waste from the actual building materials, some of the other debris that might be produced from your DIY building project can include treated wood, paint and solvent wastes, glues and roofing tars, and a variety of other materials. And all of this material, hazardous and otherwise, has to be removed, handled and disposed of properly and legally. This list represents many of the more common materials that are often used in building projects. Because this is not a complete or exhaustive list, it's a good idea to check the content and ingredients of everything you use in your project. Some of these items are also considered “Universal Waste” by the state of California. This means that they are materials that can be handled and disposed of in a different way from most other hazardous waste materials. It's also important to remember that all construction waste and other types of industrial wastes should simply be treated as potentially containing hazardous wastes. It's always better to err on the side of caution! As a DIY homeowner, you like doing things yourself. And that might include hauling and disposing of your project debris. But not everyone wants to deal with the messy, difficult, and sometimes dangerous task of DIY construction debris removal. This is the most labor-intensive option. You’ll need to fill up your own vehicle with trash and drive around town to various dumps and recycling centers. You might save some money, but you also run the risk of damage to your vehicle, or you could end up needing medical getting an injury. 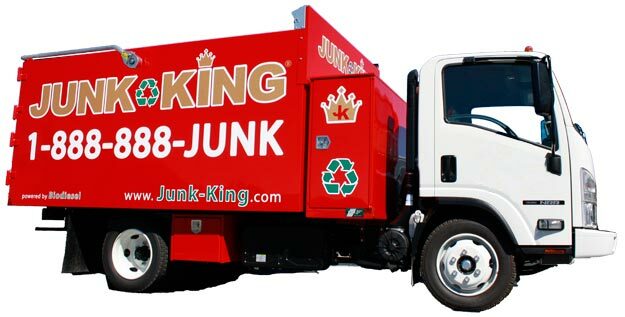 For professional junk removal you simply make the call, and we show up with the workforce and equipment to take care of everything. Point the way — you don’t need to carry debris to the curb or take it anywhere — and we’ll haul it away and recycle everything we can. What about the hazardous stuff? For your actual hazardous waste, your best bet is to find the local disposal center in your city or county that is authorized to handle that type of material. Don't know where that is? No worries! You can simply go to the website Earth911.com and use their location tool to find the proper facilities in your area.